With Bitcoin falling, you might expect mining activity to follow. That hasn’t happened. The combination of declining prices and a rising hash rate — which measures computing power — shows how complex the economics of cryptocurrency mining are. 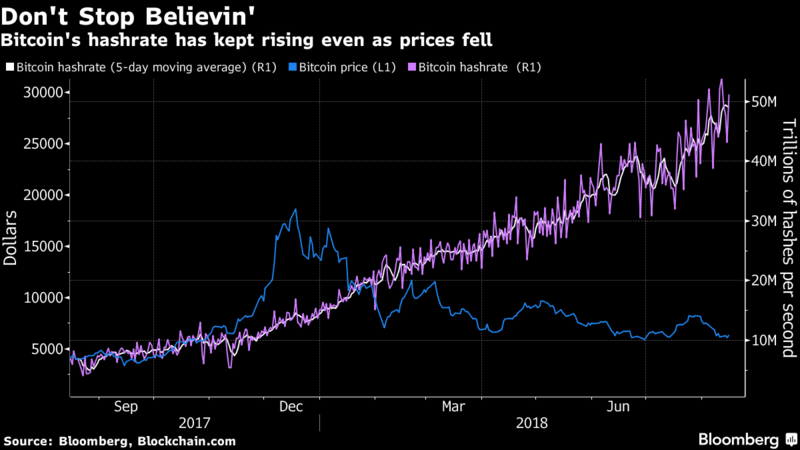 An increasing hash rate means Bitcoin mining is still profitable enough for many players to stay put, defying speculation that prices have fallen past break-even points. That may be a reflection of how sophisticated Bitcoin mining has become after last year’s 1,400 percent price rally. While that drew a fair share of amateurs mining from their basements, the lucrative rewards also drove major miners to up their game by snatching up increasingly speedy chips and setting up shop in places with cheap power. That’s helped them squeeze out smaller players as prices fall to the $6,000 level. New Bitcoins are created when computers compete to process transactions by solving complex puzzles in exchange for tokens. As mining power increases, the calculations needed to generate new digital coins become harder — a mechanism designed to limit supply and dominance in the hands of few miners. The race to get ahead with top-notch technology has intensified so much that miners became key customers for semiconductor giants such as Nvidia Corp. and Taiwan Semiconductor Manufacturing Co. And because of such advantages, the business became increasingly institutionalized and concentrated in the hands of companies like Bitmain or Bitfury. Various analysts have have tried to calculate the break-even price for miners, which may offer support for prices. Bullish research firm Fundstrat Global Advisors has estimated $8,000. Morgan Stanley has said that large mining farms make money only with Bitcoin trading above $8,600, according to a CNBC report. Researchers at CoinShares, which offers cryptocurrency investment products, estimated in a May report the average marginal cost of a Bitcoin is $6,400. The digital currency traded at about that level on Thursday. The number varies depending on the miner’s efficiency. Genesis Mining, for instance, is still expanding capacity, Streng said. Miners that also manufacture equipment have the benefit of immediate and cheaper access to their hardware and can adjust prices of their products to maximize profits, according to the CoinShares report.